The U.S. is in serious trouble. The great U.S. Bakken oil field supposedly responsible for making the United States energy independent, is now showing signs of peaking. 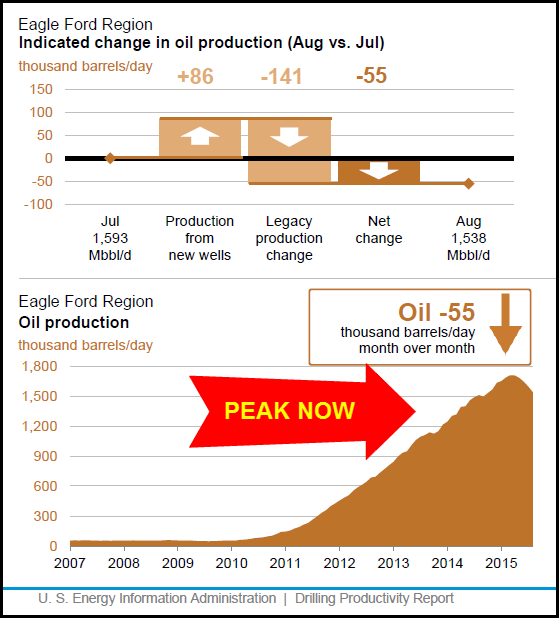 Not only has oil production from the Bakken declined significantly, so has the Eagle Ford. If these two shale oil fields have indeed peaked, the collapse of the U.S. economy will certainly follow. According to the U.S. Energy Information Agency (EIA) May 2015 Drilling Productivity Report, shale oil production from these two fields is forecasted to decline 78,000 barrels per day (bd) in June. 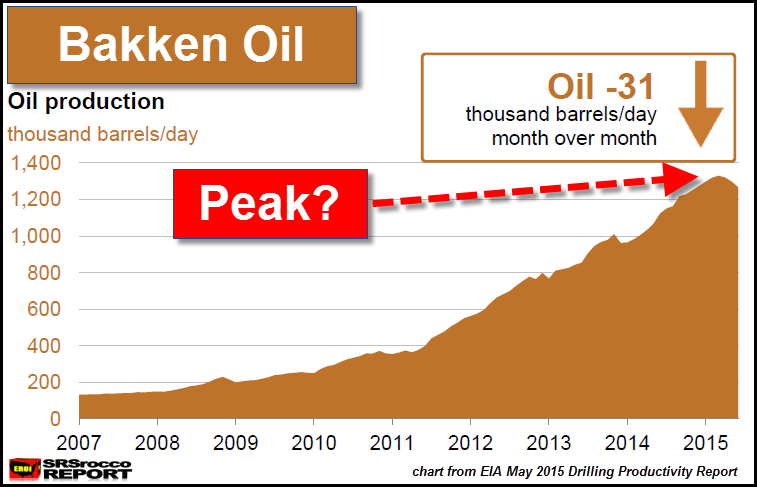 If we go by data from the EIA Drilling Productivity Reports, the Bakken peaked in March at 1.328 million barrels per day (mbd) and the Eagle Ford at 1.733 mbd. If we look at these two charts (especially the Eagle Ford), we can clearly see the current peak and decline is more severe than any small down trends in the past. Furthermore, this just may be the beginning of a much steeper decline to come later in the year. Today’s rig count is 83 (lowest since January 2010)(all-time high was 218 on 5/29/2012) The statewide rig count is down 62% from the high. Now, this drilling rig data is just for North Dakota’s portion of the Bakken. There is a small part of the Bakken in Montana, but the majority of production comes from North Dakota. In addition, total drilling rigs in the Eagle Ford fell from 218 a year ago, to 105 currently. Moreover, the EIA Drilling Productivity Reports are estimates and not actual production data. If we go by the North Dakota DMR data, they show a peak in Bakken oil production taking place in December, not in March as the EIA reports. Thus, the EIA’s current estimates may turn out to be overly optimistic. In order for shale oil production to increase, the companies must continue drilling and fracking wells at a high sustained rate. Even though drilling rig counts are down significantly (50-60%) over the past year, there was a large backlog of unfracked wells that continue to be completed and put into production. However, once the industry works through majority of these backlogged wells, production will fall precipitously. The U.S. Shale oil companies free cash flow was a negative $10.4 billion in 2014 compared to a negative $2.9 billion in 2013. The average price of West Texas crude oil was $98 in 2013 and still the group suffered a negative free cash flow of $2.9 billion. With a 33% decline in the average price of oil from Q4 2014 to Q1 2015, the top oil companies suffered a 335% increase in operating losses. How long can these companies survive with combined losses of $20+ billion? Even though the average price of West Texas oil may rise to $55-$60 for Q2 2015, losses will still continue. Very few Americans realize a country’s wealth is based upon its natural resources. The U.S. was the Saudi Arabia of oil production during the 1940-1950’s. However, after U.S. oil production peaked in 1971, larger oil imports were necessary to meet growing domestic demand. The U.S. was able to import oil as it controlled global trade via the world’s reserve currency… the fiat U.S. Dollar. Basically, the United States was able to live off the wealth and resources the rest of the world by running continuous trade deficits while increasing debt. Unfortunately, the world has grown tired of taking worthless U.S. Dollars (continually printed into oblivion by the Fed) for real goods and services. The U.S. financial system died in 2008 and has been propped up by massive Fed and U.S. Govt monetary printing and liquidity. This allowed expensive shale oil to be extracted which gave the illusion that the United States could once again become energy independent. Once it’s perfectly clear that U.S. shale oil production has peaked, it will signal the collapse of the U.S. economy. Why? The U.S. is in severe trouble as the BRIC countries continue to work on an alternative trade system around the Dollar. When the U.S. Dollar is no longer needed as the world’s reserve currency, it will severely impact the price of imports, especially oil. Which means, U.S. oil imports will decline on top of falling domestic shale oil production. This will cause economic activity to decline with no end in sight. It will be the death knell of the once great U.S. economy. Investors acquiring real estate for the past several years (at supposed bargain basement prices) will find out that PEAK OIL will utterly destroy the value of most of these assets. There will be very few assets to protect ones wealth in the future. In my opinion, gold and silver will be two of the safest assets to own in a peak oil environment. If you want a good clue that will impact the U.S. financial and economic situation going forward, keep your eyes focused on the Bakken and Eagle Ford oil production. They are the key.